Root down on Friday March 29 with Rwandan born Belgian jazz singer Ineza at Peggy’s Skylight on George Street in Hockley. A rising talent on the London Jazz scene; her music, from 8-10pm, mixes jazz, R&B, soul and hip-hop after which, DJ Daddio plays until late. Tickets are £8 in advance or on the door. Paul Deats’ jazz piano accompanies afternoon tea (£22 for two or £12 for one, free entry for just drinks) from 2-5pm on Saturday March 30. Fresh from her star gig at Pizza Express Dean Street in London pianist/singer Wendy Kirkland is joined by Pat Sprakes on guitar and Mat Short on bass at Stray’s jazz in Newark from 3-5pm. Back at Peggy’s from 7pm are the Unity Quartet; a Hammond band in the classic Blue Note style led by Matt Ratcliffe on keys and featuring Chris Bowden on sax, entry is £10. 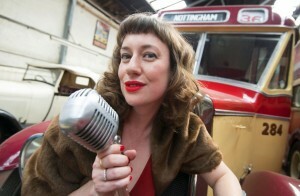 It’s the Barton Bros’ Street Food Smoke Up at The Garage in Chilwell from 5pm; I’m singing jazz and pop with the Trent Connection Big Band alongside father-daughter team Martin and Leanne Belcher from 7.30pm. Reeds star Matt Palmer’s Trio perform at The Pelican club in the Lace Market from 10pm until midnight. There’s a Mother’s Day Mezinee at Peggy’s on Sunday March 31 with Me and Mrs Jones (Rachel Foster on vocals, Paul Deats on the grand piano, Dave Shields on double bass and Steve Smith on drums from 1-3pm) entry is £8. Helen Gayle sings at The Lion in Basford with her band from 1.30-3.30pm after which there’s time to catch Matt Palmer and co again at the Yarn Bar in the Theatre Royal from 4-6pm. Ben Martin’s band entertains at The Bell Inn on Angel Row from 8.30-10.30pm on Monday April 1 – no joke!. Wednesday April 3 marks the big launch of the Midlands World Music Consortium in Nottingham at Peggy’s; tickets are available on the door for £7 from 7pm. Matt Palmer also leads his Eagle Jazz Band at the Risley Park Jazz Club from 8-10.30pm, admission is £9. On Thursday April 4 Jazz Steps present young pianist Fergus McCreadie’s trio; voted Best Newcomer in the Parliamentary Jazz Awards, he also featured in the finals of BBC Young Jazz Musician of the Year in 2018. His music is dynamic and beautifully crafted, reflecting the Scottish landscape and musical traditions while honouring the American and European jazz legacies. He’s joined by David Bowden on bass and Stephen Henderson on drums at the Bonington Theatre in Arnold from 8pm, tickets are £12/5 NUS. Triol led by Matt Ratcliffe on keys perform for this week’s Jazz Discovery Thursday at Peggy’s; entry is just £5 and doors open at 7pm. Pianist/saxophonist Stephen Sherriff and I perform at the Pelican Club in the Lace Market from 9-11pm; I’ll put down my percussion to play keys and sing while he has a blow for some numbers. Where no entry fee is mentioned please assume your ample purchases from the venue will support the live music.